Price Predictor. 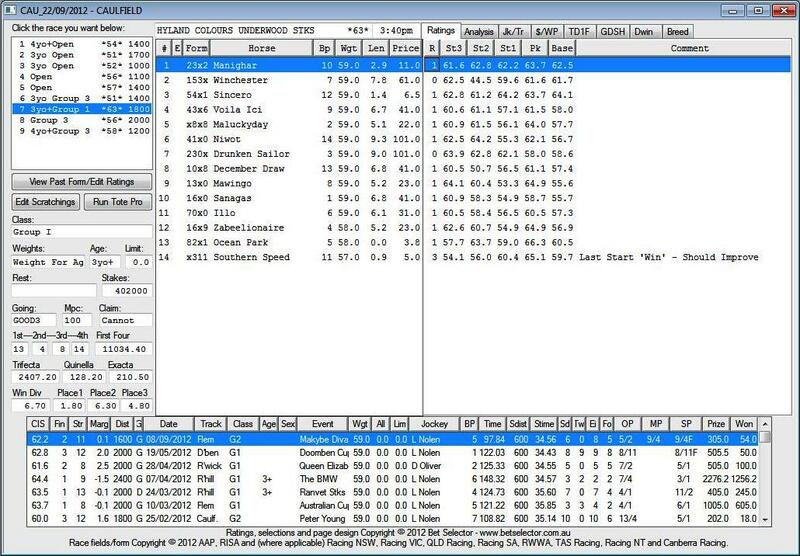 This is the ratings and form display part of Bet Selector that has evolved from the original Price Predictor program first sold in 1987. System Selector. 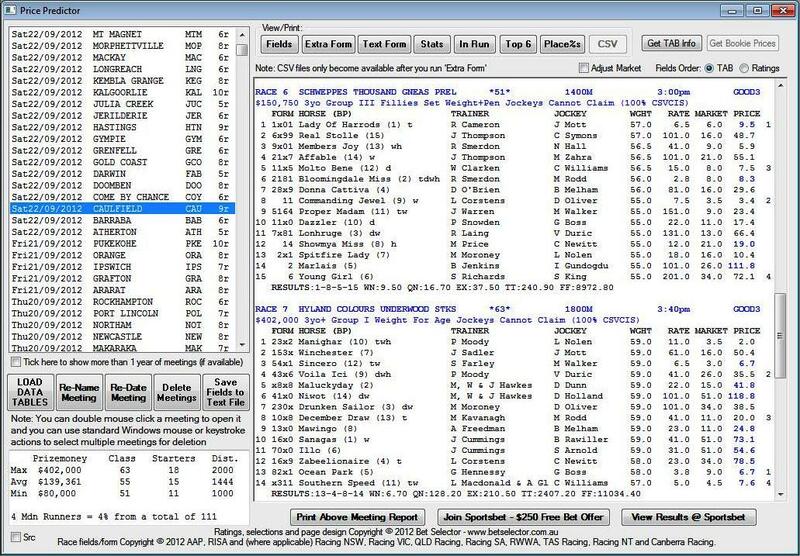 This is the system testing part of Bet Selector that can remember all your systems and test them against upcoming race fields at the click of a button. Race Day Live. 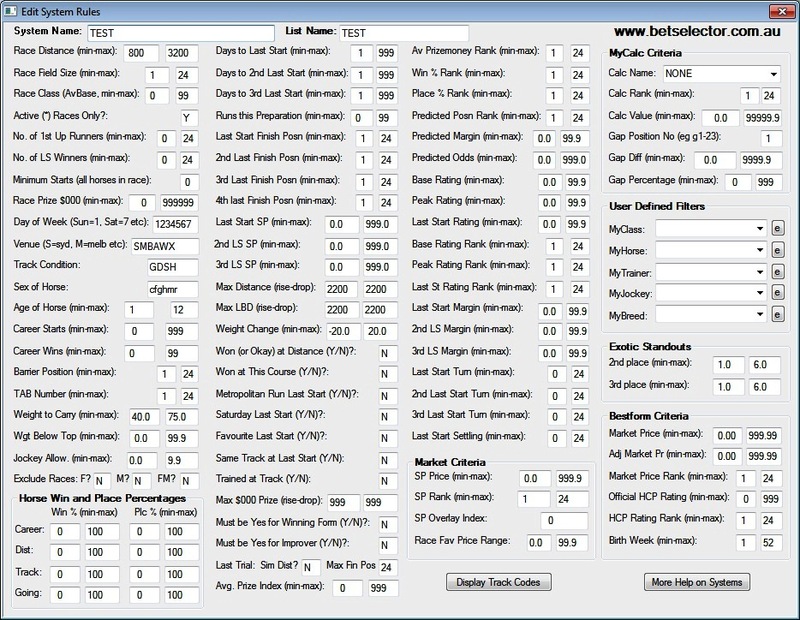 This part of Bet Selector is used to automatically collect scratchings each morning and results each evening. It can also be used throughout the day to update scratchings and results as well as keep tabs on pre-race approximate dividends. Now creates exotic bet combinations (previously in Tote Pro). The following screen shows detailed statistics and form for a selected horse with our past performance ratings in the bottom left CIS column. 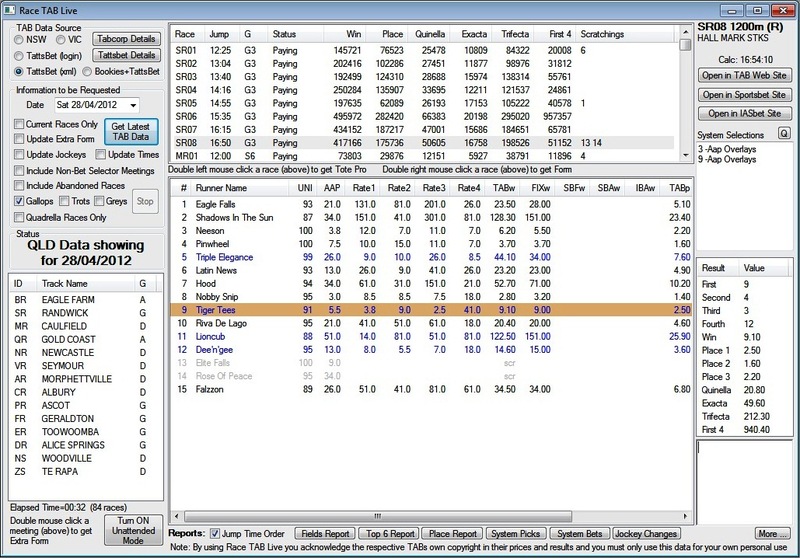 The "Horse Data/Edit" area in the middle of the screen includes data you can change (which in turn will cause the predictions to be modified) and include the horse's last three start ratings (Rs1, Rs2, Rs3), the Base rating (weighted average of last three ratings), the distance of the horse's "best" performance out of its last three starts (LBD) and its peak ratings over a similar distance to the upcoming distance (PKDR). All of the above screen shots display Bet Selector's rated price for each horse in a race. Knowing what dividend a horse should be paying is important to the concept of value betting whereby you only bet a horse if it is paying a fair price. Top rated horses will not always be over the odds and this value information is helpful in determining which horses should be bet and which should not. To get started you simply select the desired TAB via the radio buttons in the top left hand corner and then click the "Get Latest TAB Data" button. 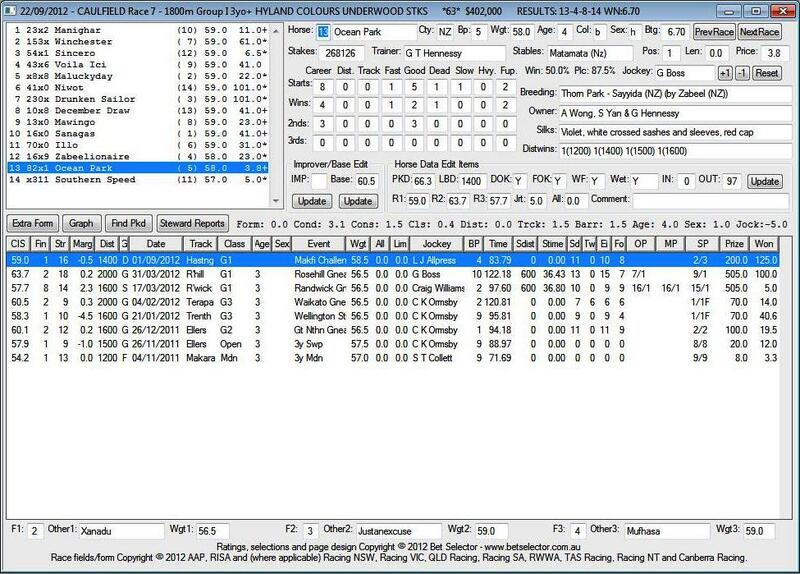 Then as the following screen shot shows you get all the days meetings listed in the bottom left hand list box and all races in the top list box. By simply clicking a meeting in the left hand list box, the top list box is positioned at the first race for that meeting and you can then click on a race to get race details in the larger lower list box (if results are in for the race in question then they will appear on the far right).